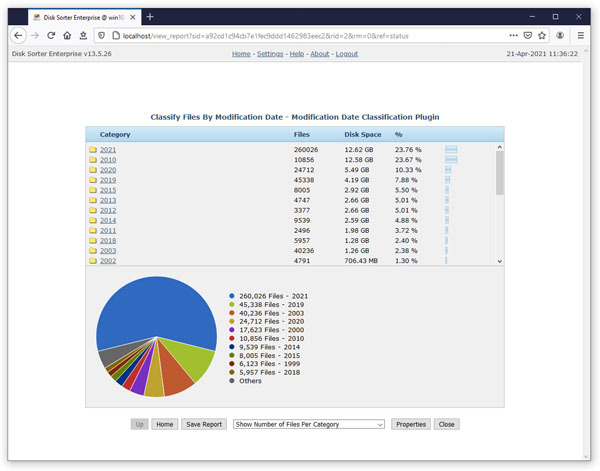 DiskSorter Server provides multiple types of file classification charts allowing one to display the amount of disk space per category, the percent of disk space per category, the number of files per category and the percent of files per category. In order to change the currently displayed chart, click on the chart type selector located under the chart and select an appropriate type of chart. 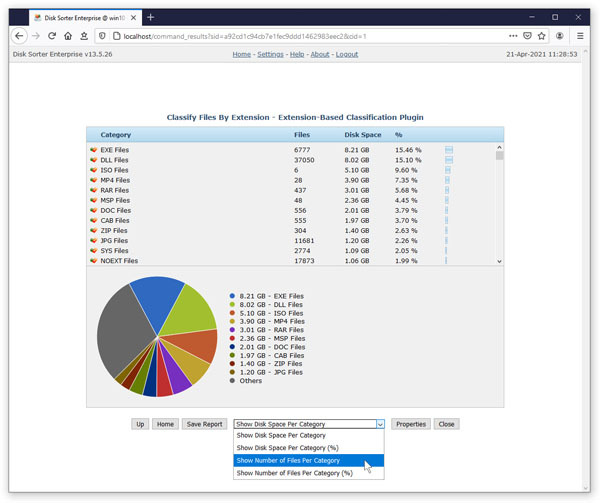 In each file classification report, the chart displays file categories according to the file classification plugin that was used for the file classification operation. File classification plugins included in a default DiskSorter Server installation are capable of categorizing files and displaying charts by the file type, extension, user name, creation, last modification or last access dates, etc. In addition, advanced users are provided with the ability to design custom file classification plugins using a simple XML-based format.